STEPHANOPOULOS (voice-over): This morning from Newtown, Connecticut, a special edition of "This Week." Tragedy at the elementary school. (UNKNOWN): Everything was just normal, and then it all just changed. STEPHANOPOULOS: Twenty-seven killed, most in the first grade. (UNKNOWN): She is (OFF-MIKE) I'm so blessed to be her dad. (UNKNOWN): Evil visited this community today. STEPHANOPOULOS: Evil met by bravery. (UNKNOWN): I said there are bad guys out there now, and he is the good guy. STEPHANOPOULOS: This morning, we remember those lost. OBAMA: They had their entire lives ahead of them -- birthdays, graduations, weddings. (UNKNOWN): This was not God's plan. This was a man who has serious issues in his life. STEPHANOPOULOS: And now, as America grieves, how should our leaders respond? What can all of us do to stop this senseless violence? (UNKNOWN): We will find a way to heal. STEPHANOPOULOS: We'll get to the heart of those questions right now. ANNOUNCER: From ABC News, this is a special edition of "This Week" with George Stephanopoulos. Tragedy at the elementary school, reporting from Newtown, Connecticut, George Stephanopoulos. STEPHANOPOULOS: And good morning from the library at Newtown Middle School. This is where the 20 children killed at Sandy Hook Elementary would have continued to learn and grow, just down the road from Newtown High School, where President Obama will come tonight to comfort the families, thank the first responders, and console the community still in shock. The heartbreak here is magnified by the age of almost all the victims, little children, 6 and 7 years old, all in just the first grade. Overnight, the shooter's father, Peter Lanza, released his first public statement: "We are in a state of disbelief and trying to find whatever answers we can. We, too, are asking why." And this morning, America is honoring the victims. Today, every NFL team will observe a moment of silence before the games. The Giants and Patriots will wear special decals on their helmets. Our guests and experts are standing by for a conversation about what happened and why, to discuss what it means to take meaningful action -- that's President Obama's phrase -- and to reason about a shattering moment of mindlessness. We begin with the latest on the investigation. With me now, Brian Ross, our chief investigative correspondent. And, Brian, investigators are beginning to piece together what happened in that terrifying 10 minutes in the school. ROSS: That's right, George, they say they are making good progress in knowing much of the how, although less of the why of the stunning crime. In particular, they are focusing on the weapons used. There were three weapons recovered, two handguns, and a semiautomatic assault-style rifle that authorities believe was owned actually by Adam Lanza's mother, Nancy. Her friends say she was a gun enthusiast who bought the weapons for self-defense when she was divorced and lived in a large home by herself and often took her sons, her friends say, to a nearby firing range for target practice. STEPHANOPOULOS: So they confirm that the weapons belonged to her, but there had also been some reports, at least one report, I believe, in the L.A. Times, that the shooter may have tried to buy a weapon recently. ROSS: Our reporting doesn't confirm that. And the fact is, in Connecticut, there is a waiting period to buy any weapon. You need a permit to buy a handgun, not a long rifle. But even so, there's a waiting period. And if there was an attempt to buy one in a short period of time, that wouldn't work. STEPHANOPOULOS: There had also been some information earlier that the shooter's mom may have had some connection to Sandy Hook, may have been a substitute teacher or a volunteer there, but the superintendent has now said that is not the case. So do we have any better idea of why Adam Lanza chose this school? ROSS: Well, the superintendent has said that the mother, Nancy Lanza, did not work there, she was not a teacher, but her relatives say she did volunteer as a teacher's aide at Sandy Hook apparently around the same time that Adam was a student there. He was a troubled young man, according to friends, and according to relatives, Nancy had many issues with the school district about how they were treating him and handling his particular special needs, so that may have been a source of conflict. And at one point, according to the aunt of Adam, the mother pulled Adam out of the public school system and home-schooled him because of her unhappiness with the way he was being treated at school. STEPHANOPOULOS: And the police also spent an awful lot of time at that -- at the home, which is also a crime scene, of course, where the mother was murdered. What else have they been able to find inside that home? ROSS: Well, they say they have made good progress from evidence found in the home, unspecified, as to the why and the motive. We don't know if that means there was a note or some sort of a video left, but they say they are making progress in determining a motive here that was involved in which, you know, he started the day by shooting his mother and then drove about 10 minutes to the school. So he had a very determined mission in his head when he started that day, Friday. STEPHANOPOULOS: I saw one report that the hard drive -- the hard drive of his computer at the home had been broken. Is that true? ROSS: We haven't been able to confirm that. There have been a number of reports. It's hard to know. Police are, they say, purposely keeping a lot of these things close to the vest as they put together a full picture. The best information, really, about Adam and his background comes from former classmates who attended school with him and say he was awkward and socially very ill at ease around people, didn't like to be talked to. He was a member of the tech club at his high school. Friends say he was very bright, very smart, but very withdrawn. STEPHANOPOULOS: But the mystery still, why he did this. ROSS: That remains a serious question. There seems to be some connection, at least in his twisted way of thinking, that put him on that path, but it's not certain yet just what that was, George. STEPHANOPOULOS: OK. Brian Ross, thanks very much. And as we said earlier, so many Americans joining in to honor and remember those lost on Friday and this whole community. On "Saturday Night Live" last night, a children's choir sang "Silent Night." STEPHANOPOULOS: And here in Newtown, a continuous vigil, as the community comes together in tears and prayer. ABC's Juju Chang is at St. Rose of Lima Church this morning. Good morning, Juju. CHANG: Good morning to you, George. The second mass is already underway here at St. Rose, and the outpouring of grief is so staggering, state troopers are having to control the flow of traffic. People are coming together to express condolences, come together as a community, and to ponder those questions to which there are never easy answers, like, how does a gunman slaughter such innocents? All this while more photos, more images are emerging of lives cut short, snapshots, if you will. There are 20 children who died in those two classrooms at Sandy Hook. All were just 6 or 7 years old. And of those kids, nine of them left behind siblings. Robbie Parker, who's the father of one of those children, spoke poignantly right here at St. Rose Church about his daughter, Emilie. She left behind two grieving parents and two little sisters. PARKER: She was an exceptional artist. She also carried around her markers and pencils so she never missed an opportunity to draw a picture or make a card. And (inaudible) two little sisters in delighting in teaching them how to read, dance, and find the simple joys in life. CHANG: And of the six adults who died at that school, we're also hearing about acts of heroism. We know the principal died after she went to go and confront the gunman. We've heard of one teacher, Vicki Soto, who shielded some of her children by putting them -- hiding them in a closet and then by protecting the other children literally with her body. She lost her life that day. Monsignor Robert Weiss, who's the priest here, has been planning funerals for his congregants. We learned a short time ago from church officials that there will be eight funerals here for eight children, eight families devastated. But it's not just this church. There are houses of worship around this community that are comforting those who have lost their innocence in a way here. There are makeshift memorials popping up not just with candles and flowers, but with childlike objects, with a soccer ball signed from the Newtown Soccer Club or little Teddy bears that a child, 6 or 7, would take to bed, and signs that say, "Hug a teacher today," or, "Sleep in heavenly peace." There are four masses, George, planned at this church today. And one sad, final footnote: On each and every one of those aisles is a box of Kleenex on either side waiting for the outpouring of tears. George? STEPHANOPOULOS: OK, Juju, thanks very much. Let's get more now from the elected officials in the state of Connecticut. I'm joined by the governor of Connecticut, Dan Malloy. Thank you for coming in this morning, Governor. I know you have been going around the clock from the very beginning, that firehouse right down the road here, meeting with those families who are just shattered right now. MALLOY: Yeah, it's -- you know, those of us in Connecticut have seen this play out in other states and other nations, and we always thank God it wasn't in our community or in our state. And obviously, when something like this happens it's a gigantic shock to everyone. We have spouses having been lost, daughters, sons. The damage done to the community, as well as, obviously, to those families is pretty staggering. STEPHANOPOULOS: I know you've had to tell some of the parents the worst news they could possibly hear, that their child had died. MALLOY: Yeah. Friday, it -- it was clear to me that -- that there was a reluctance to -- to speak to the families. But it was also clear to me that we knew everything we needed to know at that point, and so it fell upon my shoulders to inform the family of what had transpired and that their loved one wouldn't be joining them again. And it was -- it was a tough, tough time. STEPHANOPOULOS: We are also -- as Juju just reminded us -- hearing stories of real bravery. The principal, Dawn Hochsprung, and psychologist, Mary Sherlach, both charging. MALLOY: ... yeah -- works for the state of Connecticut. And there was, as those details were breaking, there was a sense of -- of pride, but obviously profound -- profound loss that she tried to shield children from the effects of those gun rounds. STEPHANOPOULOS: What more can the state do for this community right now? MALLOY: We're doing everything we can. And I've made it perfectly clear from the moment that we were notified that whatever resources are necessary to help the community restore itself as quickly as possible, including helping with a school building, working with other communities to make sure that there's enough classrooms. There will be a great number of funerals. We have assets ready, state troopers, other police departments, anything they need, quite frankly. I think the first selectwoman has done a marvelous job. The police chief is performing at the highest standards, although it's a very small department in a relatively small community. So they need help, and we're going to give it. STEPHANOPOULOS: And you're helping with the police chief, as you just said, in the investigation. What more can you share about where this all stands right now? It does seem like this man had a pretty committed plan. MALLOY: He shot his way into the school. The school was locked. He used a weapon to open up the glass, and then walked in. STEPHANOPOULOS: He blasted right through it? MALLOY: Right, with several rounds, a number of rounds. He discharged to make an opening and then went through it, went to the first classroom, as you know, went to the second classroom. We surmise that it was during the second classroom episode that he heard responders coming and apparently at that decided to take his own life. STEPHANOPOULOS: And the response was pretty quick, within 10 minutes. MALLOY: It was -- it was, to the best of my knowledge, pretty -- pretty quick from the time that the call was made and the call of -- the first call, we believe, was made by one of the people in the office who was injured, but will recover. And then, obviously, additional calls were made after that. But, you know, this -- this sick fellow, you know, clearly mentally ill, killed his mother, proceeded to go on and kill a great number of people. STEPHANOPOULOS: You know, I know you've had to deal with emotional issues in your own family, and there are some statistics I've seen, Connecticut's public mental health system provides coverage for less than 1 in 5 Connecticut residents. Is there anything more that can or should be done to address these young men who are, you know, driven by demons? MALLOY: Well, actually, you know, I'm not sure which statistics you're using, but we -- we have actually started a program well ahead of the changes to the national Medicaid policy, so we actually have 83,000 people covered in our state who wouldn't be covered in any other state right now. It's an expensive proposition, as you might imagine. We also do put a great deal of credence and importance, I should say, on mental health. I think our country needs to step it up quite a bit in that regard. We need to reach out to families that are in crisis. And it appears that there was a crisis in this family. They need to know that there are resources there. But having said all of that, this family had the -- had the resources personally to -- to handle the situation, by all appearances. But, you know, these are -- these are difficult issues. I think our nation needs to take a very different approach to mental health, and we need to speak about it more honestly, just as we need to do other things. STEPHANOPOULOS: And, finally, President Obama coming to Newtown tonight. What does the community here want to hear from him? MALLOY: Well, I think an expression by the president of the United States that he understands the difficulty that this community is going through is, I think, greatly appreciated by the community. I think what motivates the president is his desire to touch the family members who want to have that conversation, who want to be assured that the president of the United States understands that the pain that they're suffering from. And -- and I suppose that there will be questions in that session with those parents or those siblings, but a level of reassurance that they'll get from the very highest office in our nation. STEPHANOPOULOS: Governor Dan Malloy, thank you very much. STEPHANOPOULOS: Let me turn now to Senator Richard Blumenthal, Democratic senator from the state of Connecticut, also Senator-elect Congressman Chris Murphy also here with us this morning. Senator Blumenthal, you have also spent most of the last 48 hours right here. BLUMENTHAL: I've spent a good part of the last two days here in this community. And I must, first of all, add my thanks to the governor for his strength and determination, but also to the community, which has really come together and demonstrated a kind of fiber and faith that is remarkable. I've spent time in this community before and always been impressed by the real links and bonds between people. You know, the ambulance and fire department are largely volunteer, so that many of the heroic stories here are about volunteers coming forward and trying to deal with this searing, almost unbearable pain that so many feel knowing the families, knowing the victims. And, of course, as a parent myself, four children, I can really have some sense of what they are going through. STEPHANOPOULOS: And, Congressman, this is -- this is in your district. You've been representatives for many years. And I've seen it just in the last couple of days, this is a community that is tightly tied together. Talking to Monsignor Weiss yesterday, he had baptized many of the children in that school. MURPHY: You want to talk about the quintessential small New England town, it's Newtown. There's a labor Day parade that's the pride of this community that runs through Main Street every year, and every single school and community group plans the entire year to be part of that celebration of America. It's a small town, a very tightly-knit town, a town that probably grieves a little bit deeper because of this incident, because everyone that was taken was within a few square miles of each other. It will be more difficult, but a town that can be rebuild, because its faith is so strong and because its ties to each other are so strong. There've been miracles that have happened every day since this tragedy hit, and it points the way towards the way that Newtown -- because of its close-knit nature -- can heal. STEPHANOPOULOS: The schools here are going to be closed tomorrow. What is the step-by-step process going forward after that? MURPHY: Well, I think that's going to be a consultation with the first selectwoman and the board of education. I think it's important for students and for faculty to be able to process this together, and so I think there is a need for this community to get back to some semblance of a schedule. But each individual faculty member and each individual student and families are going to take their -- their own time. And so I think we are still 48 hours after this incident just trying to figure out how to think about it, never mind how to actually go by the step-by-step process of grieving and reconstructing this community. It's going to take a while. STEPHANOPOULOS: How to think about it and how to talk about it, and, Senator, I know that you -- as we move on, want to begin a conversation in the Senate about how the country can come together to address this violence. BLUMENTHAL: ... and civil, as a United States attorney, the chief federal prosecutor, and 20 years as attorney general. And I'm hearing from the community, as well as my colleagues in law enforcement, we need to do something. And I'm hearing from my colleagues in the Senate around the country, some in states like Wisconsin and Colorado, where there have been similar horrific, horrible tragedies, maybe not involving children with this kind of uncomprehensible kind of circumstance, but we need to do something, at the very least, perhaps, about the high-capacity magazines that were used in this crime. But, of course, the investigation here is continuing. And we'll learn more. And out of respect to the families and their grief, at this point, I'm not going to be more specific about that conversation, but certainly this horrible episode and incident and crime by this deranged person possessed by demons, as you have put it, will spur and transform, I think, the national conversation. And I intend to talk about it on the floor of the United States Senate perhaps as early as this week. STEPHANOPOULOS: Congressman, do you think this can be a tipping point? MURPHY: Well, I think the tipping point should have happened a long time ago, frankly. And as I think eager as people are going to be to find some simple solution from a policy standpoint, we have to acknowledge that there is no simple solution, that, yes, there needs to be a conversation about gun control, but also about the way we treat mental illness, also about the culture of violence in this country, which may have contributed to the way in which this very disturbed young man thought. This is going to be a very complicated process of asking why, but we also have to admit that it's going to be a very complicated process figuring out what to do from here. We need to talk about it, though. The time for sort of saying that we can't talk about the policy implications of tragedies like this is over. And for us here in Connecticut, while we're going to grieve and make sure the families have everything they need, we're going to be on the floor of the Senate very soon talking about where we go from here. STEPHANOPOULOS: And we are all grieving with you today. Thank you both. STEPHANOPOULOS: Thank you, Governor, as well. And when we come back, more coverage of the tragedy at this elementary school, Sandy Hook. How can we make our schools more secure, keep our kids safe? We'll be back with more of this special edition of "This Week." STEPHANOPOULOS: Thank you, Governor, as well. And when we come back, more coverage of the tragedy at this elementary school, Sandy Hook. How can we make our schools more secure, keep our kids safe? We'll be back with more of this special edition of "This Week." STEPHANOPOULOS: And we are back now at Newtown Middle School for this special edition of "This Week." We are joined by our chief justice correspondent, Pierre Thomas, the mayor of Hartford, Pedro Segarra. And thank you both for joining us. I want to talk a little bit more about the law enforcement aspects of this. And, Pierre, four months ago, August, coming out of Aurora, you said we would be here again. All too soon. THOMAS: Didn't mean to be prophetic, but these are just the facts. In this country, we have a love affair with guns. They are sold commercially. In fact, the FBI did background checks on Black Friday to Sunday, the Friday after Thanksgiving, and there were 154,000 gun checks on that day alone. And in fact, in November, for the month of November, Americans attempted to buy 2 million guns. So what that means is that people who are heading to the dark side, if you will, they have easy access to weapons. So this is a very complicated situation. STEPHANOPOULOS: The guns -- the guns are everywhere. What people will point out, of course, is that in this case the shooter didn't have to go buy a gun; they were right there in the home. THOMAS: Well, we have information that the mom or the family had at least five weapons readily available. And assault-style rifles are bought and sold in this country pretty much like handguns, and the particular weapon we believe that was used in this particular crime has the capacity, the assault-style rifle, of 30 weapons. Typically, it can fire -- it also can hold up to 100 or more rounds and it can fire those bullets within seconds. STEPHANOPOULOS: And you've made the point that the volume of the gun sales means the -- we're beyond the point of no return. There are so many guns out there right now in the United States. THOMAS: To use the cliche, the genie's out of the bottle. There are more than 200 million-plus guns already in circulation, so if you stop selling them today, forever, they are not biodegradable, they're not going anywhere. So you would have to figure out how to remove them from the streets. That would be very difficult. STEPHANOPOULOS: But, Mayor, you have been working on that in the -- in the city of Hartford. You've had some success with buying those guns back. SEGARRA: We did. We had a gun buyback program about -- a couple of weeks ago. We're a small city of 125,000, yet in less than three hours, almost one weapon per minute was turned in. So there is a desire on behalf of the communities to turn these weapons back in, although I don't know how much of those efforts could lead to preventing something similar from happening to what happened here in Newtown, but there is a need to have some focus on using a systems approach, because there are different systems that come at play here, in terms of mental health systems, but we -- we have been effective and just also by working through our shooting task force and other programs that we've had to try to limit the number of shootings. But, you know, this is a call, a wake-up call, in addition to the things that have been happening, and if this -- if this crisis, if this horrific incident does not send a message that some stronger and immediate action needs to happen in our country, I don't know what will. STEPHANOPOULOS: You have joined a coalition of mayors who've called for more action. President Obama said it's time on Friday for meaningful action. What specifically would you like to see? SEGARRA: First of all, I think that, as soon as we get through this process of trying to help our community heal, have the U.S. Conference of Mayors, through the leadership of Mayor Bloomberg, Mayor Menino, and our -- our U.S. conference chair from Philadelphia, Mayor Nutter, come together. I mean, we are -- we're -- we're the closest. The towns and cities are the closest to having to deal with the effects of this violence. So it should be incumbent upon us to solidify ourselves, to be a more powerful voice, more powerful than we've ever been, in coming together to make sure that we start with things such a ban on assault weapons, to make sure that we put the pressure on and really meet the challenge of having some balance. What we're asking is for some balance. We do recognize our constitutional right to bear arms, but I think that this has gone to a point now that -- to afford some people with the ability of conducting these mass exterminations is just not what we want. STEPHANOPOULOS: And this has struck home for you personally. Your father and two friends, the victims of gun violence. SEGARRA: Absolutely. My father was killed when I was a year old. I never got to meet him. I never got to know what it is to have a father. So this hits very close. And I ended up in Connecticut, because I lived in the South Bronx, where two of my two closest childhood friends were killed, as children, through guns. So I feel strongly about it. I'm very emotionally invested. But I recognize that it's -- it's going to have to take a group of very dedicated people to working together, because we do need to tap different social systems. I worked as a psychotherapist. When you get people that are distraught into a clinical setting, it doesn't take very long to find out that there is a problem. The issue becomes, how do we reach out in a way that eliminates the potential for these folks to do this damage by having a wider net? STEPHANOPOULOS: Mayor Segarra, Pierre Thomas, thanks very much. Much more of our special edition of "This Week" ahead. 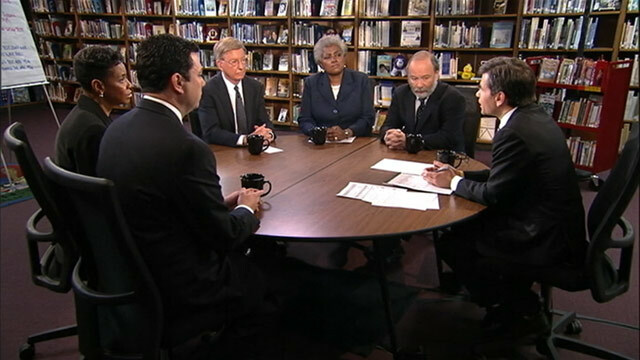 Our roundtable joins us next. OBAMA: These neighborhoods are our neighborhoods, and these children are our children. And we're going to have to come together and take meaningful action to prevent more tragedies like this, regardless of the politics. (UNKNOWN): It's not right to talk about this on yesterday. It should have been a year ago. It should have been two years ago. It should have been three years ago. I'm going to take him at his word that we will try to do something to reduce gun violence in this country. And I'm willing to work with him on what that will be. (UNKNOWN): I think we have to be careful about new -- suggesting that it's new gun laws. I mean, there's -- you know, we need to look at what drives a crazy person to do these kind of actions and make sure that we're enforcing the laws that are currently on the books. STEPHANOPOULOS: And we are back in Newtown, Connecticut, for our special edition of "This Week." I am joined on our roundtable by George Will, Donna Brazile, Joe Klein of Time magazine, two members of Congress, Representative Jason Chaffetz and Congresswoman Donna Edwards. And, George, let me begin with you. And I watched those clips from earlier this week and Friday and Saturday, and there's a depressing sameness to the conversation coming out of these tragedies. WILL: Yes. And our response is always to think that there's some defect in the social system or some prompting in the social atmosphere that causes this and, therefore, we assume, we can tailor a law to correct the defect. The problem is, the law can do three things. It can deter with severe punishments. Of course, we already have lots of deterrents against murder. They can impede the access to public spaces or to weapons. Or, third, the law can monitor and, in some cases, confine people who meet the profile of these people. The problem with this is, these people are determined, psychotic, and often suicidal. It's very difficult to deter someone like that or impede. And then when you come to the question of monitoring or confining, you look at the profile. These are often men, young men, young, unmarried men, young men who are socially awkward, and sometimes young, unmarried, socially awkward men who have been diagnosed or even prescribed some kind of psychotropic medicine. The civil liberties and privacy issues involved in trying to monitor people in this not insignificant cohort who fit that profile are insuperable. STEPHANOPOULOS: Well, you've laid so much on the table right there. Donna, I saw you nodding your head, at least parts of it. BRAZILE: Well, yeah, angry, alienated, disconnected from society, they need help. At a time when we're talking about budget cuts, two-thirds of states have cut services to mental health agencies, $1,300 is the cost of treating someone with mental health disorders, $17,000 is what we end up paying when we have no beds, no facilities, when Medicaid cannot fill the gap. The gun safety laws in this country are broken. And I would hope that members of Congress would take a look at some commonsense steps that we can take to at least fix the background system so that we can at least know when people are buying guns, who they are, and if they have a record. STEPHANOPOULOS: I want to go to the members in just a moment, but, Joe, let me bring that to you, that one of the first things you're going to hear in this case is that the background check wasn't even tripped because all the guns were in the home. KLEIN: Right. Right, I mean, you know, I think that there are things you -- there are things you could do that will limit these incidents, nothing that you can do that will totally eliminate them. The striking piece of news to me today was that the mother was very angry at the school system for not giving her the support she needed to deal with her son. Right now, all over this country, there are parents of young men with severe psychological problems who are scared to death that their kids are going to go and do something like this, too. And in many cases, after they pass the age of 18, these parents may want the children to be in -- you know, in some kind of a residential setting, but they don't have the power, the legal power to have anything to do with it. We got rid of mental hospitals in this country 50 years ago, and that was a good thing. They were supposed to be replaced by medication and by residential settings, like halfway houses, but nobody wanted to have halfway houses in their neighborhoods. So we have abdicated our responsibility to the mentally ill in this country, to the parents of the mentally ill who are suffering right now. STEPHANOPOULOS: So, Congressman, what is the government's responsibility here? CHAFFETZ: Well, I wish there was one thing that we could do to make sure that this never, ever, ever happens again. And God bless those families who are dealing with a situation I can't even -- I can't even imagine. But we -- we have to deal with the mental health aspect. I think it's fair game. I think we absolutely should talk about the intersection of a lethal weapon and it relates to -- to mental health. Absolutely. We got to have that discussion in this country. And we also have to deal with the new social ramifications of the bombardment and the immediacy of social interaction between violence, the realism that you find in games and movies. Some people, young people, as they're making this transition from their teen years into adulthood, aren't able to mentally make that transition. And there does need to be help. But we're also going to need to look to families and communities and churches. It's not just a government solution. STEPHANOPOULOS: Picking up on what you said, you know, there have been some reports, Congresswoman Edwards, that this young man was, you know, playing a lot of those very violent, very realistic games. EDWARDS: Well, I mean, I think that, you know, there are multiple things that we have to do here and use this circumstance, the tragedy in Newtown, to create both policy solutions, but also cultural solutions. I -- you know, I think that it -- while it is true, we have to rebuild or build a fabric for mental health services, especially for young people, to give parents the resources that they need and wrap our (inaudible) this community will need and the surviving families and children. But we also -- we've got to get the guns. I mean, we just do. There were assault weapons used here, weapons that are used by military and law enforcement. And it seems to me that there can be a bright line for removing those kinds of weapons. There can be a bright line for background checks that don't just cover 60 percent of the guns, that come through gun shows and individual sales. We regulate cars in that respect, knowing who transfers a car more than we know who transfers a weapon. There are real things that we can do, and we have an obligation to. And if this doesn't call us to action, George, I don't know what will. STEPHANOPOULOS: And, well, then that's one of the questions we're going to find out an answer to soon, I suppose. But, George, about -- on that point exactly, you know, kind of striking you read in the 24 hours after this that this -- a very similar incident happened in China, a man in an elementary school with a knife, not an assault weapon, almost two dozen kids injured, but not killed. STEPHANOPOULOS: Didn't stop, but it does lessen the occasion of violence, doesn't it? EDWARDS: And, George, since Columbine, there have been 181 of these school shootings. WILL: We did -- remember, we did -- we did have a ban -- we did have a ban on assault weapons. When we put the ban in place, these incidents did not really decline in a measurable way. And when we took it off, they didn't increase in a measurable way. KLEIN: There were five guns in that house. The shooter chose two semiautomatic pistols and one semiautomatic rifle. He did not choose the two deer-hunting rifles. It seems to me that the congresswoman is absolutely right. There is a bright line here that we should be able to, you know, to hunt -- you know, hunters should be able to go about their sport, but there's no need to hunt with a semiautomatic rifle. There's none. CHAFFETZ: Well, look, I'm a conceal carry permit-holder. I own a Glock 23. I've got a shotgun. I'm not the person you need to worry about. And there are millions of Americans who deal with this properly. It's our Second Amendment right to do so. But we have to look at the mental health access that these people have. CHAFFETZ: No, there are prohibitions on lots of -- gun rules are -- are very stringent. There's a lot of conjecture out there that -- that I don't think necessarily would solve this particular problem. And I want to look at anything that we think will solve all the problems, but we have to, I think, look at the mental health aspect. EDWARDS: We do have to look at the mental health aspect, but the complex problems require complex solutions. And it isn't one thing. It's all of these things. And some people would like to deflect the conversation only to the mental health problems that are severe and we need to deal with, without dealing with the reality that we have. A lot of weapons out there, and people have access to them, and we have to figure out a way that we can protect our children in their kindergarten and first-grade classrooms. STEPHANOPOULOS: I want to bring this to Donna Brazile. And as I do this, Donna, you know, the politics of all this generally shows -- I want to show this Pew support -- support for gun control generally does not go up after these major shootings, whether it was after Aurora, Colorado, went up about 2 percent after the Gabby Giffords shooting in Tucson, went actually down 4 percent, Virginia Tech, it went up a little bit, as well, back in 2007. And the president has been reluctant to take this on in the past. You saw him on Friday say it is time for, quote, "meaningful action." What do you expect? And do you think now that the president is not going to face election again, he will address these matters in a different way? BRAZILE: Well, I hope so, George, because I think there's expectations now -- not just from the families, but others who would like to see the president take some concrete steps. He's talked about it before after Aurora, where he said that we need to have tighter restrictions on people with mental disabilities from having access to these guns. He spoke again at the National Urban League about this. But clearly there's -- there's a time for this. And hopefully the time is sooner, rather than later. You know, I'm a -- as a southerner, I'm a big advocate of the Second Amendment. I grew up with guns. I grew up with people who understood how to use guns responsibly. I did not grow up with people with assault rifles and all of these other semiautomatic guns. I do believe that we need a conversation, a real, deep conversation, and this cannot be stopped simply because people are afraid of the politics. WILL: You also grew up to be the campaign manager of Al Gore, who lost the home state of Tennessee, the myth is, at least, in part because he supported gun control. This is a political, not a jurisprudential problem. The most important case in Second Amendment jurisprudence, the Hiller case, concerning an absurdly restrictive D.C. law, is really much more permissive than people realize. And I'm not sure that there'd be a Second Amendment impediment to banning a category of weapons. There would be a political one. EDWARDS: But the large capacity of the (inaudible) used in these weapons that allow -- allowed this perpetrator to go into a school and each of the victims suffering multiple gunshot wounds. This is just not acceptable. KLEIN: There's a -- you know, I think that we -- we can't think about this in terms of eradication. These incidents are always going to happen. KLEIN: We can -- we can think -- the mental health piece is obviously important. I think there's a bright line on gun control, as well. But there's a third piece, and that is the celebration of violence. We not only have a Second Amendment in the country. We also have a First Amendment that protects, you know, Sylvester Stallone's right to fire thousands of bullets in any given movie. But I think that the -- you know, that what we need to do in this society is treat people who create violent movies and violent video games with the same degree of respect that we accord pornographers. They need to be shunned. STEPHANOPOULOS: You know, I want to bring -- and I want to add to that. We're getting a lot of response on Facebook, as well, about how all of us covered this in the media in the wake of these shootings. I want to show some of that right now. Scott Lamarche: "Media sensationalism contributes more to this than guns. It's always the person who pulls the trigger, not the gun that kills. We need to stop making these killers famous." Bill Cotton: "Stop the wall-to-wall coverage. You are helping drive this." Darla Reigel: "Stop glamorizing the killers. Keep them with no name." And I have to say, we've actually tried in this case to talk a little bit less about the killer, but, Congressman, this is also something -- you know, Joe brings up and those viewers bring up, as well, how do we talk about this in a way that doesn't encourage the contagion? CHAFFETZ: I don't know that the news coverage that I've seen is glamorizing the killer as much as allowing the rest of the country to grieve. As a parent, we all shed a tear. I do agree with Joe that you put violence and death and gore in a movie, you're not going to get an R rating. You do something else, OK. But I've got to tell you, I think the movie ratings are terribly misleading when it comes to violence, death, gore, and glamorizing it. EDWARDS: And all of those things are true because we do have a culture that celebrates violence, but it doesn't take away our responsibility. And I want to urge and challenge my colleague to work with me, to work with us on this so that no parent has to experience what these parents and families do in Newtown. The bright lines between those who are hunters and shooters and outdoorspeople, but they don't need an assault rifle. They don't need high-capacity magazines that create havoc and viciousness and death. And we can do that. Background checks, we can do that. We can close that up. And then we allow ourselves to have -- to enjoy the Second Amendment rights that are so important, but also we respect human life. BRAZILE: George, when my little nephews left New Orleans after Katrina, I'll never forget what they said. "Auntie Donna, I don't want to hear gunshots at night." Too many of our kids are living with guns. They're living with the fear of violence. They're dying, sometimes in their homes, just walking home from schools. And while this tragedy is incomprehensible, we got to understand that there are too many of our babies who are being murdered every day, senseless, and that's why we need to have this conversation. STEPHANOPOULOS: We're having it. The question is what to do and what is possible to do. WILL: Well, we ought to bring in Mayor Rahm Emanuel of Chicago. Chicago is in an epidemic of violence with young, largely unparented -- that is, no father in the home -- adolescent males. Now, that's a problem quite separate from this. Another thing that we're going to do and makes one heart sink is this, George. We're going to ratchet up the security of schools and elsewhere in public spaces. Our public spaces are already blighted by this. STEPHANOPOULOS: And on that point, Joe Klein, people should be reminded, parents should be reminded that the overwhelming majority of schools in this country are safe. KLEIN: That's right, although, you know, I had this creepy feeling walking into this school this morning that I wasn't in a place of safety in this town. STEPHANOPOULOS: Even though you know rationally that's not true. KLEIN: Even -- it was a completely irrational thought, but I'm sure -- and when I -- and when I say that, I think about all the children who are going to be walking into schools tomorrow. STEPHANOPOULOS: And that gives us a place we actually have to stop, because we want to talk about that with Dr. Richard Besser when we come back. We'll be right back, this special edition of "This Week." (UNKNOWN): This was not God's plan. This was a man who has serious issues in his life. Why he'd want to destroy innocent children, I -- no one can figure out. STEPHANOPOULOS: We're grieving with you. (UNKNOWN): I appreciate it. I'm so tired. It's just brutal. STEPHANOPOULOS: And now, as the nation mourns those lost here in Newtown, we also honor our fellow Americans who serve and sacrifice. This week, the Pentagon released the names of three soldiers and Marines killed in Afghanistan. And we'll continue with our special edition of "This Week" from Newtown. (UNKNOWN): The strength that she gave us and the example that she showed us is remarkable. She is an incredible person, and I'm so blessed to be her dad. STEPHANOPOULOS: May they all rest in peace. So hard to see the age of those victims. We're going to talk now more about how this community here can cope. We're back with Congresswoman-elect Elizabeth Esty from this community, Father William Hamilton, a chaplain with the ATF, helping counsel first responders, also our own Dr. Richard Besser. And, Doctor, let's pick up where Joe Klein just left off. This school tomorrow will be closed, but everybody coming back on Tuesday. How do the parents and the teachers talk to the kids here and then, more generally, parents at home? BESSER: Right. You know, talking to kids, it depends so much on their age, their level of development, and knowing your own child. Very young children who weren't in this community, you want -- you want to shield them from this. But in this community, when you -- when you talk about rebuilding and moving forward, schools play an absolutely critical role. It allows children to -- to normalize their life. They're getting back into the routine. It also provides a very safe place for children to talk about what they're experiencing, what they're feeling. And teachers and administrators who are well trained -- and they're getting training here -- will be able to identify kids right now, but also going forward who are not coping well so that they can get this specialized services that will -- will help prevent long-term problems. STEPHANOPOULOS: And, Congresswoman, what more are you hearing from the people here in the community -- this is your community -- about what they need, what they want right now? ESTY: Well, they want time to heal and time to grieve. I was -- I'm a mother of three children, and I was a room parent in a first-grade classroom, and I just can't imagine the grief that they're going through right now. But in meetings yesterday with the wonderful first selectwoman, also a mother herself, Pat Llodra, there's a lot of focus on just what the doctor was referring to, supporting and keeping these children together, keeping them with their teachers, allowing this community to grieve together. The depth of their grief is a reflection of the depth of the love this community has. It's a very special place. And I think it's important for people to realize that about Newtown. STEPHANOPOULOS: And -- but you made this point yesterday, Rich, you have to also be careful with these kids that they don't somehow define themselves by this tragedy. BESSER: I mean, that's so very important. There are phases. And we're so early in this, but you don't want these children to become tragedy celebrities. You don't want it to be, as they grew up, what they're known for. They need to be known for how they play soccer or -- or how they study in class or what they did for someone in their community. But if you're not careful, this can be the defining thing in their life. STEPHANOPOULOS: And, Father, so often forgotten the toll this takes on those who come to save, those who come to help, the first responders, and that is your job to counsel them. HAMILTON: Exactly. The first responders, the members of public safety, do tremendous work for us, and yet they're parents, as well. They have children. They're seeing this. And most of the time, they're responding to criminal activity of people who may be lifelong criminals. Now we're dealing with the situation we're dealing with, the innocence of a community, of its children, of its future. And so as a result, they're responding to people that they know, people that they live in the community with, that they share with. STEPHANOPOULOS: And I would imagine also that's the -- they respond to the innocence, but they also have to confront those who perpetrate these crimes. STEPHANOPOULOS: And they must be dealing with so much anger. HAMILTON: It can be. And that's -- that's a real emotion, and that's why we want to be around so that they can have a safe environment where when that anger builds up, then they -- they can express it so that it doesn't take over them. You know, the anger cannot be an impetus for how they act, but rather as a result of what they've seen and what they've had to do. STEPHANOPOULOS: And, Congresswoman, what more will you be looking to do in this community over the next several days and weeks? ESTY: Well, to be support, to make sure they have all the resources we can bring to bear, working with the governor, the local community. There's been an outpouring of support from around the country for trained professionals to come and help. But, again, it needs to be on focused on Newtown. It is its own unique place. And the father is absolutely right. The first responders, too, are traumatized. You know, they are parents. These are their loved one, their cherished ones. So I want to make sure we're keeping them as part of this process. And when I take office next month, surely there's going to be much more work to be done to make sure their deaths are not in vain, that we do something as a country, that we respond in a way that acknowledges that this is unacceptable. But right now, it is the focus on cherishing this family. STEPHANOPOULOS: We only have about 30 seconds left, Rich, but on this point about mental health and identifying those who might be susceptible to a problem, what is the single most important thing we can do? BESSER: Well, I think access to care. There are so many people who either don't have health insurance or their plans don't cover mental health services or only cover it while they're -- while they're a child, you need to bridge that, so that if you identify someone, there's someone -- somewhere you can send them so that they're getting care. STEPHANOPOULOS: Richard Besser, Congresswoman, Father, thank you all very much. That is all for us today. Thanks for sharing part of your Sunday with us. David Muir will have the very latest from Newtown on "World News" tonight, and I'll see you tomorrow on "Good Morning America."